The “M-word” participant probably shares a common, uncomfortable experience of initiating a company to GRI reporting. Defining materiality—essential issues to the company—is a required step of GRI, an international framework that has become the standard for sustainability reporting. The GRI reporting process entails answering questionnaires, compiling data and digging into the depths of company practices—sometimes bringing up issues preferably left undiscovered. Within materiality, however, also exist valuable business assets like competitive advantage, risk management and innovation. Businesses, like Ford, Intel and Green Mountain Coffee, have a history with defining materiality through the creation of a Materiality Matrix. These matrixes have evolved quickly and are beginning to sophisticate. Green Mountain Coffee’s materiality matrix, for example, uses bubble size to express how much control the company has around certain issues—like water availability. Water availability is a major concern, but depends on factors beyond the influence of Green Mountain. A smaller circle indicates a lowered level of control over this material issue. Risk management tools paved the way for the materiality matrix; so it’s little surprise that now the matrix is giving back. Risk management is often the main driver for using formal materiality processes. But materiality matrices can do what risk analysis cannot: map risk in terms of impact to business and its stakeholders. If used effectively, the materiality defining process has the ability to shield, or at least alert, companies to potential sources of disorder. The above materiality matrix depicts Hyundai’s 2010 and 2011 materiality. Several of the material issues in 2010 changed their positions, often to a level with higher impact. There are also additions to the matrix in 2011, which showcase how quickly new concerns sprout up and need processes to address them. Clearly, materiality is an indispensible tool, but it is still forming. Could materiality matrixes, for example, help companies gain from disorder in the antifragile sense? Could a Shadow Materiality Matrix extend to showcase how a company could benefit from the high-impact, low-probability black swan event? The black swan event is only one of many scenarios that could occur. Perhaps a fanning out of possible scenarios would help companies position themselves to pivot quickly in order to adapt? This materiality matrix hearkens to the work by Andrew Kahane, Robert Constanza and others on scenario planning. While most scenario planning depicts at least four distinct scenarios that provide a basis for exploring different options and actions for a company, a Materiality Fan could extend these scenarios to express the subtleties between them, or to direct how specific divisions should respond to material issues. Risk management, however, is supposed to sift out the most cost-effective approaches for minimizing harm to an organization. Key word: cost-effective. While a Shadow or Fan Materiality Matrix may detect the one event or trend that could make or break the business, what about everything else? Is awareness of the material landscape really worth the cost to business? The short answer: ask Target (who had pre-hack tried to rally a technology security coalition among competitors), Tesco, the State of California or currently the European Central Bank (who is probably not happy about a €48 billion asset overstatement). Detecting these events and preparing for them would have saved a lot of money to both business and stakeholders. Whether money earned or burned, however, the materiality evolution reflects a general growing awareness of where companies lie within a changing global landscape. Defining material issues opens up awareness of factors generally not appraised, but have the potential to incur tremendous costs to business and society alike. We live in a material world, full of variables and distractions. 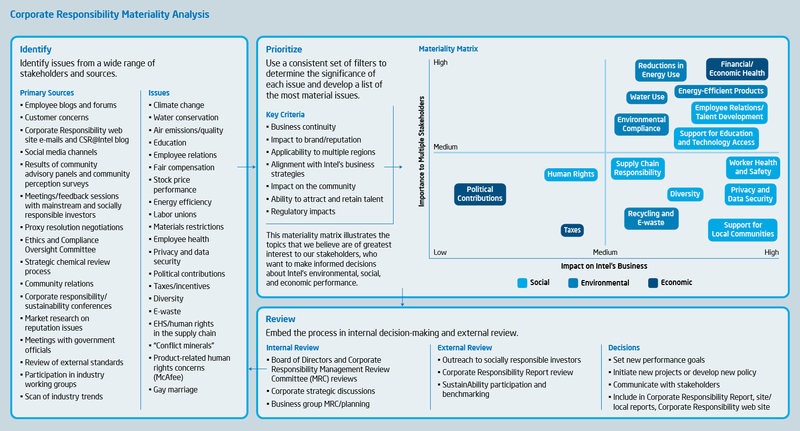 The materiality matrix helps businesses navigate their way through this maze. Where will it lead us next?